Note: The above map is only a close representation of this route. This particular route is very detailed and so it has been broken up into two separate maps below. This route starts in Land O Lakes, FL at SR 54 & Collier Pkwy. It winds thru the county of north Tampa almost up to Brooksville, east to Trilby, south to Dade City & Zephyrhills and back west to Land O Lakes. Note: The directions for this route are extensive and Gary has created a Google map with labeled turning points. Just click on the Google map above and see each of the turning points and read their associated directions. On this route you will be taken out into the open country of north Tampa. After just a short distance, you will hardly realize that you are still in Florida. The scenery on this route includes many horse & cattle ranches as well as orange groves. 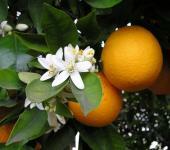 If you take this route in the springtime (March) when the orange blossoms are blooming, you will definitely smell the sweet aroma of oranges wafting from the groves. Florida is not really known for being hilly, but there are a few places along this route that will surprise you with panoramic views of the countryside. Most of the roads on this route are good, however there are a couple of roads in the middle that are narrow and are a little bumpy and may have sand or pebbles in the corners, so just slow down & enjoy the scenery. There aren't too many amenities after you get into the ride simply because you're out in the middle of the county. but later in the ride you will be going thru Dade City & Zephyrhills where there are plenty of restaurants, shops & things to do if you wish. This particular route is not a destination ride from point A to point B, but more of a combination ride with some twisties & sweepers in some places, as well as nice relaxing straight cruising roads towards the end. If you start off with a full tank, you can make the circuit without having to fill up, unless you ride hard thru the 1st half of the ride . . . then you might have to top off somewhere along the way before the end. The best time to take this route is in the early morning. You won't find much traffic out in the country, but when you get near the cities, it will slow you down some. on April 14, 2017 2 out of 2 members found this review useful. There are amazing motorcycle roads in Pasco and Hernando counties, this rider could have easily taken more scenic routes and stayed off of US 98, US 301, and I 75.
on July 12, 2018 1 out of 1 members found this review useful. Very nice ride. Twisties were very surprising for Florida. The countryside was beautiful. Definitely a recommended route. This was a great ride, took about three hours to complete and had a blast from start to finish. Thanks for the great route! on February 22, 2011 1 out of 1 members found this review useful. I'd have to say this is the best ride I've done yet in Florida. Way to go Garry. It really showed me aspects of Florida I'd not experienced before. Did the ride for the first time in March of 2009 and the smell of orange blossoms was great. About to do it again in late February of 2011. FWIW, I've run a motorcycle touring company in the northeast for 15 years. on April 17, 2009 1 out of 1 members found this review useful. on January 14, 2009 1 out of 1 members found this review useful. Great roads and great rides. Any part of this trip is worth riding. on November 25, 2008 1 out of 1 members found this review useful. These are great riding roads. Big pastures full of livestock and large wooded areas. Nice turns, good surfaces. Hess station at SR50 and Spring Lake where you can pause and refresh and meet other riders. This area is very worthy of a day spent and a tank of gas. You will not be dissapointed. on June 25, 2017 0 out of 0 members found this review useful. Alot of good scenery on this trail, however, the route seems to circle upon itself. If you have the time, I'd suggest combining this with the Green Swamp tour. Instead of heading North on 301 out of Zephyrhills, pick up 54 East towards 98. Then pick up Old Dade City Road to Rockridge Road. Continue on Green Pond Road towards 33. Once on 33, head North to Lake Erie Road and head West. Then pick up South Bay Lake Road northbound into Mascotte. Once there, turn West onto 50 and pick up Tuscanooga Road, then C469 into Center Hill. Follow their "main drag" and pick up C478 and head South and proceed towards Webster. The head South out of Webster to pick C478A and follow it until it runs back into 50. Then you can pick back up the rest of the Tampa North Circuit. on January 10, 2009 0 out of 1 members found this review useful. Recently completed the southern half of this ride. It goes through some nice rural areas and it well worth worth your time. Thanks Gary.